Unlock the power of your mind with a Mind Map ~ the ultimate thinking tool used to stimulate you to think, learn and communicate more effectively and efficiently. The technique of Mind Mapping was created by Tony Buzan and is one of the most widely used thinking tools around the world. It is often called the ‘Swiss army knife for the brain’, because it is a multi-purpose thinking tool, and is already used by more than 250 million people worldwide. 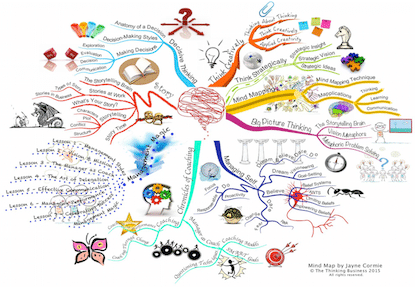 A Mind Map® is a visual thinking tool which maps out your thoughts and ideas in a brain-friendly way using the technique of radiant thinking. It combines colour, imagery, visual-spatial skills and imagination to trigger your brain to think more creatively, learn faster, remember more and communicate better. 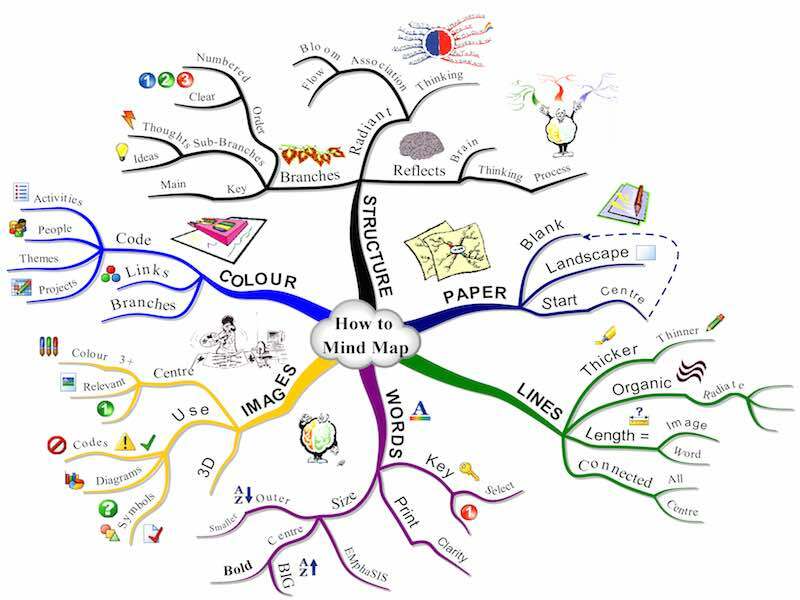 Mind maps can be hand-drawn or produced using mind mapping software applications. Prepare and present documents etc. On Mind Maps, ideas and thoughts are shown as coloured images and key words branching out from a central theme. One of the key benefits of Mind Maps® is that they help you to see how ideas link to each other as well as how they relate to the central theme. Have a look at the mind map about on the right. 1. Start in the centre – the image represents the theme/topic of the Mind Map®. 2. Select one of the main branches (thick curved line connected to the central image). This has a key word printed on it and represents an idea/thought that is linked to the main theme. Think of it as being like a chapter heading in a book. Example, the ‘Lines’ branch. 3. Read out from the centre along the branch. These are second and third levels of thought with words and images that are associated with the main branch. Example, use ‘Thicker’ or ‘Thinner’ lines; draw ‘Organic’ (wavy) lines etc. 4. Continue reading around the Mind Map® until you have read and understand the whole map.